Avery first made his appearance at the very end of Must Love Dragons. He was just a Ranger on Linus’ side who helps him out a bit. I had no idea that he was actually going to continue on into The Linus Saga as a character. He’s just one of those ideas that took on a life of their own. 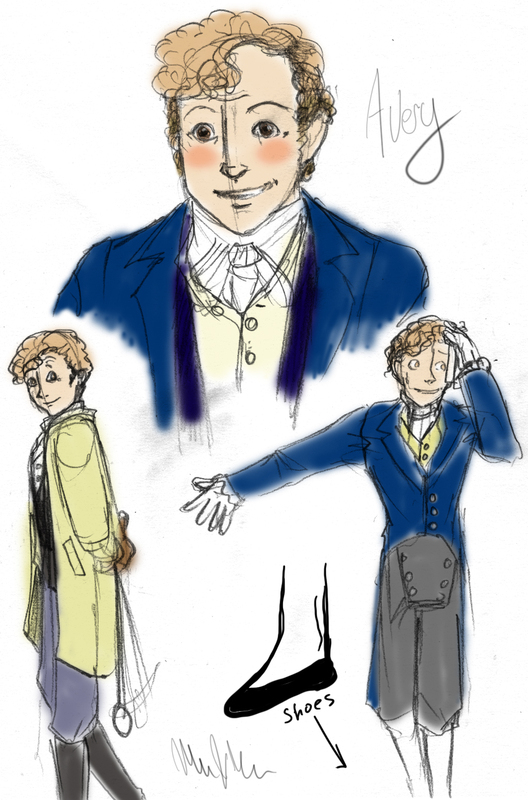 When he started out in my brain he was just an extra that was a carbon copy of Crispin Bonham-Carter’s version of Mr. Bingley in the 1992 production of Pride and Prejudice. But even if he looks identical to that in my head, he’s taken on a character of his own in the process of writing him and turned out far more interesting than I had intended. Avery is a privileged only son of Old Money, on par with hotel magnates and electronic company CEOs. He’s your classic nice guy. He always wants to help, he’s passionate about causes he believes in and never wants to have anyone mad at him. But like the standard ‘nice guy’ of today he has a lot of flaws. He’s naïve and easily led by other people’s opinions, ready to accept them without consulting the facts or his own feelings. He takes everything at face value and is quick to divide the world into black and white, until he gets another opinion to zealously believe in. So, basically he’s that guy on Facebook that will share every “share if you want to stop/ help/support____” post, and writes “THIS” about articles outlining the latest injustice without actually reading them or checking the sources—the headline’s pretty much said everything, right? So, Avery is a sweetheart, but he doesn’t have a single original thought in his brain. Unfortunately that’s starting to clash with his new family. He has a young wife and a (pending) child—another decision he made because he followed societal norms. The problem is that no one is telling him how to do this “family” thing or how to feel about it. There’s no one to form his opinions for him and no one to get him worked up into a fervor about it. How is he going to keep things going without passion for his loved one—passion he instead devotes to his work? I’ll have to find out in a future book, I guess. *The one time Avery showed the world he was his own man was when he chose to marry someone without money. It was his one act of rebellion against his family, who still constantly criticize his involvement in civil affairs. *Avery’s very altruistic and donates regularly to causes like, homes for orphans, widows pensions, schools, and apprenticeship fees for boys who might not otherwise be able to afford them. *He’s also slightly patriarchal, willing to defer to men and let them lead him around by the horns but never thinking that women or children have anything of value to contribute. He himself is unaware of this and would be quite shocked if you told him this. *Avery became a Ranger to get out going to parties and stuffy mansions. He enjoys spending time outdoors and is a formidable hunter and horseman.